Arabs start a fire near the community of Yitzhar, then attack firefighters and security forces. 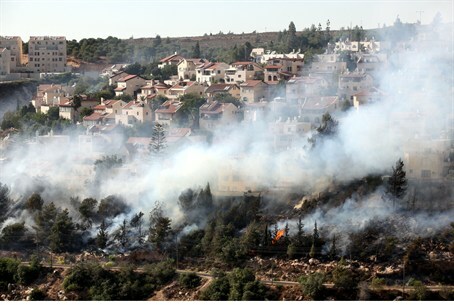 The community of Yitzhar in the Shomron was the target of Arab arsonists during the Sabbath. On Saturday afternoon at approximately 5:00 p.m. local time, Palestinian Authority Arabs started a fire in several locations west of the community. The local emergency squad and a team of firefighters who arrived on the scene were attacked with rocks that were thrown at them by approximately 200 Arab rioters. IDF soldiers and Border Police officers who arrived also were attacked and were prevented from dispersing the rioters for a long time. The Arab rioters filmed the riot and posted the video to YouTube. As the fires continued raging, residents of Yitzhar streamed to the site to assist the fire crews. Some of them responded by throwing rocks back at the Arab rioters. Only about an hour after the incident started, did the soldiers respond to the riot and dispersed the Arabs, who went back to their village. Residents of Yitzhar told Arutz Sheva that dozens of similar fires have been started by Arabs in the summers in recent years, mainly on Fridays and Saturdays. Attacks are often timed to take place on the Sabbath, when women and children are often at home while their husbands and fathers are in synagogue. Just two weeks ago disaster was narrowly averted twice on the Sabbath, as Jews in Yitzhar prevented Arabs from destroying their community with fire. Some grazing land was set alight, but homes in the area were saved. Three years ago a PA terrorist managed to burn down a home in the Shalhevet neighborhood and to stab young Tuvia Shtetman, a child living in the area. Tuvia managed to fight off the terrorist, but suffered moderate wounds. Subsequent arson attacks have caused hundreds of thousands of shekels of damage.